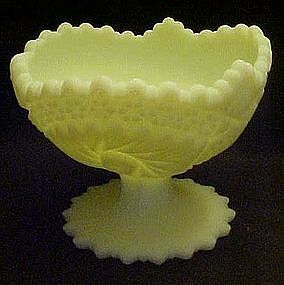 Beautiful Vintage Fenton Glass Daisies on Custard Satin Ruffled Basket. Hand Painted by Tim T (Thomas), which was listed in 2001 as GONE by Fenton. Daisies painted on both sides. In great condition -looks like it has been kept in a cabinet. 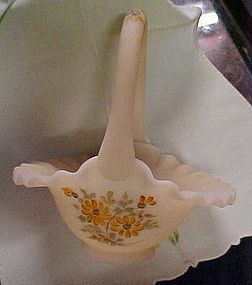 It has the Fenton Stamp on the bottom of the basket and the artist's signature. The height is approximately 8" tall and the width is approx. 7" . A magnificent little vase made of satin custard. All hand painted with little purple flowers and leaves. 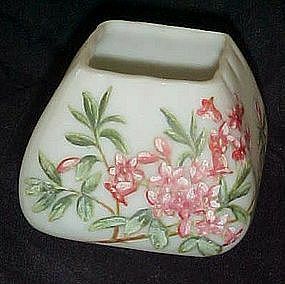 Measures just 3" tall with a lightly gathered style top. Perfect condition. Stamped on the bottom in gold, Veritable Opal Wirths, and a large 4. THis has been in the family as far as can be remembered early 1900's. Perfect condition. I personally know nothing about this marking. A wonderful old piece of collectible glassware. Great Fenton comport measures 5" tall and is in the satin custard glass with the pinwheel pattern.This piece was produced in this pattern and color from 1972-1977, Perfect condition. Embossed Fenton Logo.